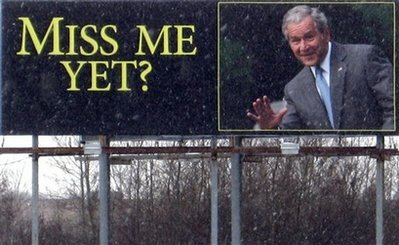 (Reuters) - A billboard along Interstate 35, taken on Tuesday, Feb. 9, 2010 in Wyoming, Minn., carries an image of former President George W. Bush and reads 'Miss me yet?'. Office manager Beverly Master of Schubert and Hoey Outdoor Advertising in Minneapolis says the message was purchased by the ex-president almost 8 months ago but was just now approved. It was reportedly slipped in as pork on the ObamaCare Health Reform bill but was split off into it's own bill last month, "so he could have it up in time for President's Day."